The Census Bureau reported that Women earned 77 cents for every dollar that men earned last year. This figure has stayed about the same since 2007 before the United States saw an economic downturn. Unfortunately, chances of women’s wages going up any time soon are slim to none. According to a prediction by the Institute for Women’s Policy research(IWPR), the gender wage gap won’t close until most of today’s employed women are already retired. 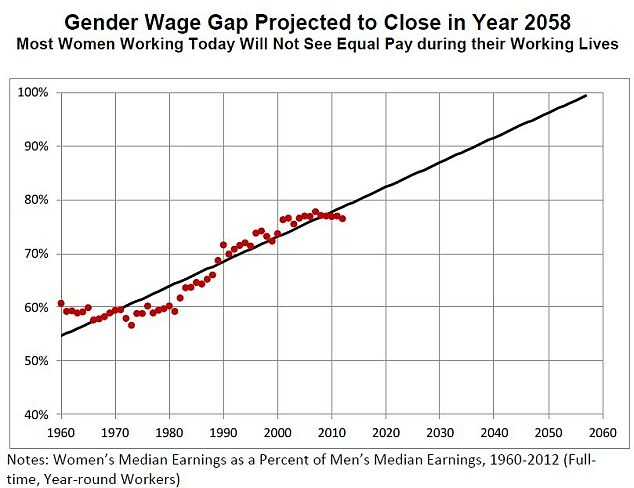 This think tank dedicated to women’s policy issues claims that the difference between average full-time pay for women and men isn’t expected to close until the year 2058. Heidi Hartmann, the president of IWPR claims that the time it will take for gender wage equality has actually become worse since her initial analysis a few years ago. Women’s wages have remained stagnant for the past couple of years and this has slowed down the process of women’s wages being equal to their male counterparts. Heidi also claims that women are among the nation’s current bottom earners and that wage growth among the lowest earning population is very slow. America also has sub par medical and family leave policies and this has pushed women out of the workplace for centuries. According to an article in The New York Times, out of 200 countries studied by California public health professor Judy Hymen, 180 of the countries offer guaranteed medical leave to new mothers, and 81 to new fathers. The United States, offered none of the protections granted in other more family conscious parts of the world. 70 per cent of American children live in homes where both parents are employed. Surprisingly little has been done to balance family and job workloads. Gender equality has less to do with people’s view of the differences between men and women and more to do with structural obstacles-like those in the workplace- that keep people from acting on their egalitarian values.